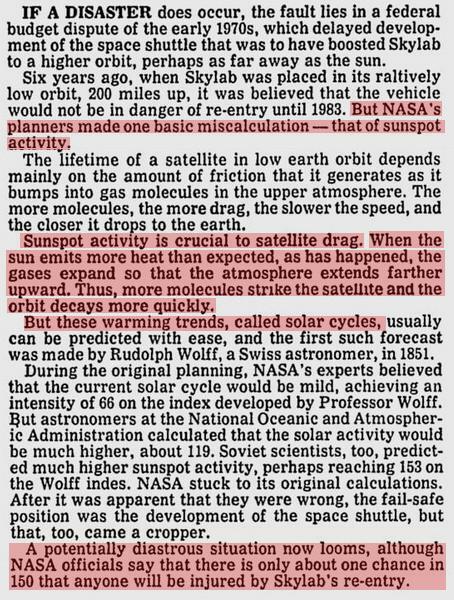 32 years later, NASA still refuses to admit that warming is due to solar activity. In 1979 we knew that these warming cycles existed when the sun emits more heat……. had long been looking for this! thanks! Steve, do you have the link for that? Is this the diurnal bulge we’re talking about? Is there data on satellite drag going back 30 years? This would be an interesting independent proxy measurement of atmospheric temperature trends, to compare with UAH/RSS measurements. Are there any astronomers at NASA any more? This one is epic LOL Thanks, I don’t recall having seen this one before! It has been common knowledge among space buffs, that Skylab had fallen to Earth due to the atmosphere not behaving as mandated by the latest “forecasts”. And yes, there is some epic, a whiff of a Greek Tragedy in seeing the last hardware from the glorious days of Apollo getting destroyed by the inability by Earth-obsessed “New Nasa” to understand the limit of its knowledge.